What is the difference between silver and sterling silver? Have you ever seen these numbers – 900, 925, 999 or 9999 – on your jewelry piece or bullion item? Some of you probably still wonder what they show or stand for. Silver is a precious metal which you won’t find in nature in a 100% pure form. This means that we need to extract it from various ores or mix it with galena and argentite. To offer silver the well-known shape, the ores undergo several refining processes. These processes separate the silver from all other types of particles. Namely, the complexity of these refining actions is the key factor that defines the fineness (and value) of silver. Thus, the first four numbers, the silver grades, showcase the amount of fine silver in a specific precious metal piece. For instance, 900 means 90% pure silver, while the remaining 10% indicate that it consists of other metals. The maximum purity can reach up to 99.99% or .9999 fineness. But the most popular highest silver purity is 99.9%, .999 or 999 – all three being the same, differing only by scale/notation. Silver with .999 fineness is called fine silver, actual silver, or pure silver; 99.99% pure silver – ultra-fine silver. Therefore, the silver having less than .999 fineness is sterling silver, being usually 92.5% pure. Silver in its original state is fully liquid. A 999 fine silver is not “suitable” for jewelry. Even the easiest attempt at making a ring from it makes the silver lose its shape. Thus, when we use silver in manufacturing jewelry items, we need to alloy it with other metals, such as nickel, copper, or zinc. These alloys make silver less soft and more durable. What is 925 sterling silver? In the US, pieces containing .925 silver and .075 copper, zinc or nickel are considered as sterling silver jewelry. In other countries, like Russia, the limit may be lower (.900 fine silver) and is regarded as enough for marking it as a silver product. Solely 99.9% pure silver is admitted to be traded at trade markets, which means that this type of silver is used mostly for investment purposes. The .999 pure silver bullion bars, coins or rounds have been famous investment options for many years. Moreover, over the last decades, they appear as more optimal than pure gold items due to the silver’s limited resources, lower price, and increasing demand. Silver bars are more common bullion pieces, which have standard sizes and almost no premium added to their production price. On the other hand, .999 silver coins are more valuable because of their collectability. Silver coins carry higher premiums since the minting process is more complex and they usually come in limited quantities. Each of these silver pieces is a signature product of a renowned mint: for example, the US Mint strikes the iconic American Silver Eagle, the Royal Canadian Mint the famous ultra-fine .9999 Silver Maple Leaf, the London Royal Mint – the beautiful Silver Britannia. If you are wondering how to find the real purity of your piece despite its .925 or .999 mark, there are certain tips that will help you find out its actual fineness. Items carrying a 925 silver value will change in color over time since the nickel, zinc, or copper will interact with the oxygen or other elements in the air. You can test the 925 sterling silver by using a special acid kit. If you apply the acid to the silver item, it will change its color if the pieces have a fineness less than .925. However, we advise you to get your piece appraised by professionals in order to avoid any damages. Do you own a pure or sterling silver item that you want to sell or authenticate? Contact NYCBullion, and we will evaluate your pure silver or sterling silver piece with high accuracy. 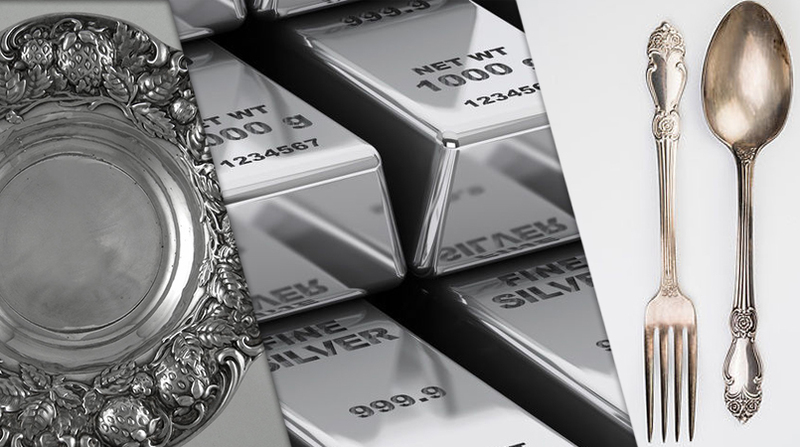 You can confidently sell any type of silver, including silver bars and scrap silver, as we guarantee the best services and quote on the market.